"Quinoa is gluten-free, has a low glycemic index and provides all of the eight essential amino acids, creating a complete protein." (quoted from my bag of truRoots Organic Quinoa). That is why I purchased Quinoa! I am always interested in food that will give our family good nutrition and taste good too. "Quinoa is an ancient traditional grain grown at 12,000 fee above sea level. It is a whole grain and has been classified by the National Academy of Sciences as one of the best sources of protein in the vegetable kingdom." (from the back of my Quinoa bag). I did a post on Quinoa back on September 5, 2012 and you can see it here! 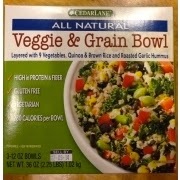 Today I at CedarLane Veggie & Grain Bowl that I purchased at Costco. It has 9 vegetables, quinoa, brown rice and roasted garlic hummus. One bowl has 280 calories and 7 grams of fat--not bad, right?! Have you tried quinoa? What did you think? I am hoping to be back on Sunday night for the Sunday Night Chit-Chat but for sure on Monday for the Letter R:) Have a great day! I just don't know whT o do with quinoa, heck I can't even pronounce it ight! Pronounced keen-wah! I particularly like it as a taco burger replacement. Has a lot of protein and tastes good too! I've heard of it down through the years, but I've never tried eating it.